Canterbury defender Mel Clewlow says Holcombe's strategy of signing high-profile players is unsustainable. The Medway side made a number of signings this summer, including England men's captain Barry Middleton, but Clewlow questions their motivation for joining the second tier side. "Anybody that flashes a chequebook will turn heads - they're not going to be able to sustain it," she said. But Holcombe chairman David South said it was just a "boost" to win promotion. 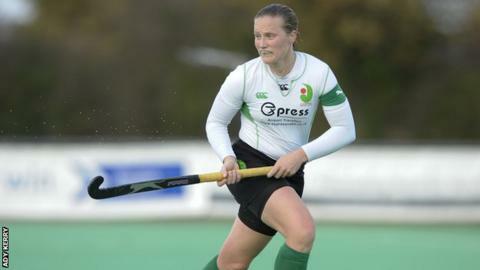 During the off-season, Holcombe signed four England internationals - Dan Fox, Laura Unsworth, Maddie Hinch and Middleton. Their men's and women's sides currently play in the Conference East, one tier below the Premier Division where both Canterbury sides play. "Obviously we are sponsoring them," South told BBC Radio Kent. "We need a boost to get up to that level." But Clewlow believes Canterbury's focus on bringing junior players through the system is more admirable. "I think we are bigger and better than Holcombe," she said. "We have over 500 juniors and national titles in our under-18 girls and under-16 boys. "A club that wants to spend and spend big, good luck to them, but they're not going to be able to sustain it. Who are Holcombe Hockey Club? Both men's and women's first teams play in the England Hockey Conference East, one level below the national Premier Division. "Yes they deserve it because they have that Olympic medal but they also need to be realistic." South, though, did admit Holcombe would try to replicate Canterbury's junior model, rather than recruit any more high-profile signings. "Mel is quite right," he said. "It is unsustainable. "Both men's and ladies' management teams have set criteria to have proportion of junior-produced players, but they take a few years to come through. "They [Canterbury] have been the model we're aspiring to. Copying is praise." South added that some big names are likely to leave the Rochester-based side at the end of their contracts. "Some will join as the club has a spirit where people enjoy playing," he said. "Certainly some will move. They are centrally-contracted, professional players on a retainer from England Hockey. "We would not want to keep the same proportion of paid players, but lots of Premier League clubs are doing exactly the same as us." Meanwhile, Canterbury captain Grace Balsdon believes if Holcombe do win promotion, his Polo Farm outfit will still remain Kent's premier side. "I don't think their depth mirrors ours," she said. "We can give their team a run for their money."